With Mother's Day just around the corner, I've been thinking of who is an exemplary mom that exudes love of food in Canada. And while several names came to mind, there are few Canadian food gurus that have the credentials of Trish Magwood. Trish was inculcated in strong food traditions growing up. Her mom cooked delicious simple food, and insisted that Trish and her three siblings enjoy it at the family dinner table. Today, Trish has earned a reputation as a successful entrepreneur and business owner of the former Dish Cooking Studio, television show host, teacher, chef, lifestyle consultant, décor and presentation guru, and James Beard Award winning author (in 2008 for Dish Entertains). And while these are prestigious accolades and credentials, she is also the devoted mother of three. In the past couple of years, Trish published family recipes from three generations in another cookbook named In My Mother's Kitchen. Like so many chefs, Trish believes in the power of the simple act of eating together at the table. Her recipes focus on simple family food that doesn't compromise on flavour and tips for busy modern cooks. What's your favourite Mother's Day memory? It wasn't until I was a mom that I realized how much my mom did and continues to do and how many thank yous I owe her. Thank goodness schools are so good with special occasions. I remember proudly bringing home crafty creations made at school for my mom and she proudly displayed them on the fridge. Now, our kids have preserved the homemade card tradition and still, they are my favourites. Nothing better than home made cards and coffee being brought to me first thing! 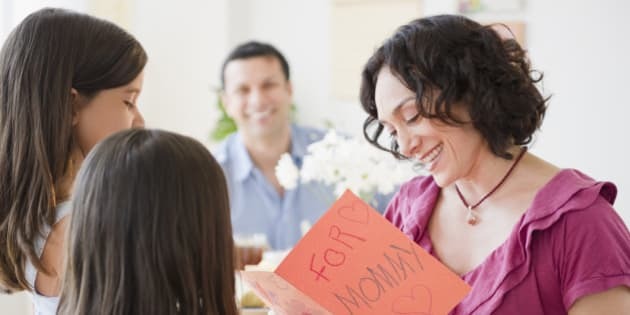 Do you have some tips for dad and the kids on Mother's Day? Like everyone, moms want recognition and thanks! It's all about how the morning starts. Fresh orange juice, coffee in bed and a bowl of homemade granola is the best way to kick off the day. Last year the kids made gift certificates for things like setting the table, making their beds -- a day off from those tasks is the best present you could give. Have the kids make gift certificates for the stuff she wants a break from -- you'll score major points. How would you spend a perfect Mother's Day? A wee bit of a sleep in. Coffee, newspaper. Breaky with the family. A Totum workout (boxing or spinning), a visit with an old friend, a few calls with close friends... and at the end of the day a great dinner with the family, glass of wine, a movie and curl up with a good book! What would be served at your perfect Mother's Day breakfast? Coffee! (Trish has her own fresh roasted, custom blend from Merchants of Green Coffee). Half a grapefruit, fresh grapefruit juice and a really yummy jam from Stasis Preserves with a warm baked goodie. To stay updated on Trish's Picks, recipes and latest projects, visit Trish's website or follow her on Twitter @TrishMagwood.